Let's ignore the fact that Vancouver's summery warmth has reverted back to rainy dreariness and indulge in some Monday morning shoe therapy. It's hard to believe that the time for spring/summer markdowns has already come when it feels as though spring never came at all, isn't it? Now's the perfect time to pick up a new pair of sandals for the impending warm weather, and on sale no less! Even though colour-blocking is a huge trend right now, I can't help but be drawn to neutral-coloured materials that exude an organic warmth. 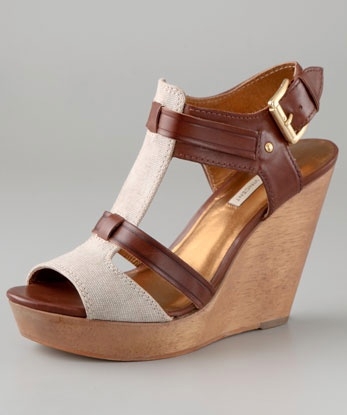 Here are my favourites from the shoe sale section of Shopbop. Fun question for readers who've been suffering the same sort of weather blues: What's the first pair of open-toed shoes you're dying to dig out of hiding and wear when the sun returns? Oh my goodness. I'm suffering from some serious weather blues. Though I did manage to wear some open toed shoes yesterday. I think I'm going to have to pick up and move to California so I can wear some of these sandals. 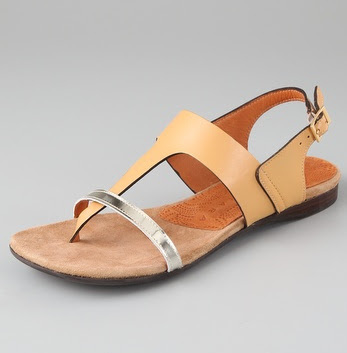 Uhh def the Modern Vintage sandals, love the sweet goes-with-everything color. Oooh, I love the Modern Vintage and Chie Mihara sandals. I'm excited to wear my Shellys London sandals that I got from Spank... I've only gotten to wear them ONCE so far. Come on Vancouver weather, lighten up! love all your picks! especially the woven flats and platforms. i'm just excited it's finally pedicure season. time to get rid of the boots! Those are some fabulous sandals! Can't wait for the warm, dryer weather – hopefully we'll have some soon. There are so many shoes I've been dying to wear, I won't dare to tell you only one! Cynthia Vincent ALWAYS has a style I like.